Benjamin “Bibi” Netanyahu (Hebrew: בִּנְיָמִין “בִּיבִּי” נְתַנְיָהוּ (help·info), also Binyamin Netanyahu, born 21 October 1949) is the ninth and current Prime Minister of Israel, serving since March 2009. Netanyahu also serves as the current Chairman of the Likud Party, as a Knesset member, as the Health Minister of Israel, as the Pensioner Affairs Minister of Israel and as the Economic Strategy Minister of Israel. Netanyahu is the first (and, to date, only) Israeli prime minister born after the State of Israel’s foundation. Netanyahu joined the Israeli Defense Forces In 1967 where he served as a commander in the elite Sayeret Matkal commando unit, taking part in many missions including the hostages rescue mission from the hijacked Sabena Flight 572 in 1972. He fought in the Yom Kippur War in 1973 and achieved the rank of captain before being discharged. Netanyahu served as the Israeli ambassador to the United Nations from 1984 to 1988, member of the Likud Party, and was Prime Minister from June 1996 to July 1999. Netanyahu was Foreign Minister (2002–2003) and Finance Minister (2003–August 2005) in Ariel Sharon‘s governments, but he departed over disagreements regarding the GazaDisengagement Plan. He retook the Likud leadership on 20 December 2005. In the 2006 election, Likud did poorly, winning twelve seats. In December 2006, Netanyahu became the official Opposition Leader in the Knesset and Chairman of the Likud Party. In August 2007, he retained the Likud leadership by beating Moshe Feiglin in party elections. 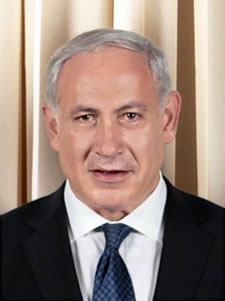 Following the 10 February 2009 parliamentary election, in which Likud placed second and right-wing parties won a majority, Netanyahu formed a coalition government. He is the brother of Israeli Special Forces commander Yonatan Netanyahu, who died during a hostage rescue mission, and Iddo Netanyahu, an Israeli author and playwright.